Voted the 13th greatest film of all time in the 2012 Sight & Sound Critics poll. Jean-Luc Godard's groundbreaking tale of the brief love affair between a petty criminal and a young American student. 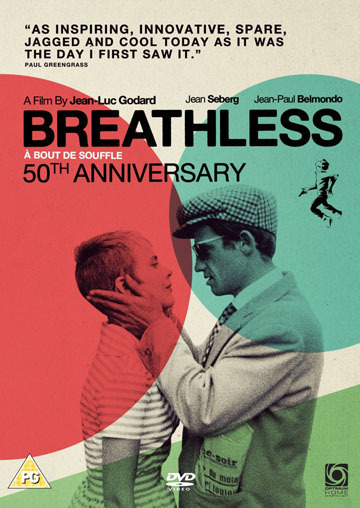 Jean-Luc Godard's groundbreaking tale of the brief love affair between petty criminal Michel (Jean-Paul Belmondo) and young American student Patricia (Jean Seberg). Michel has killed a motorcycle cop and is now hiding out in Patricia's Paris apartment, but the police are getting closer, and as Michel falls deeper in love with Patricia, his time also gets shorter and shorter. Godard's film, one of the first and most important statements of the French New Wave, caused a revolution in the way films were made, opening up many new, previously untried possibilities for cinema.